Art student and Team Fortress 2 fan Christopher Wyant put together a unique project for his university degree: a gallery of ceramic pottery that included screenshots of virtual versions of those same pots on display in a TF2 server. Just when you thought it was safe to use the words "games" and "art" in the same sentence, Wyant, who goes by the name "thedefiant" on the Steam forums, comes along and turns things inside-out by incorporating his artwork into a videogame and then using the occasionally blood-splattered results as part of his real-world art display at Auburn University. Confused? Me too. 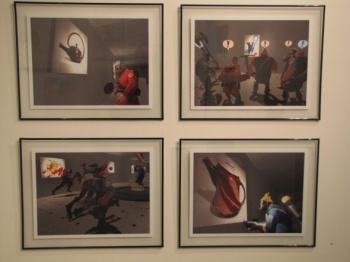 He set up a Team Fortress 2 server with 2D images of his ceramic pottery sprayed neatly on the walls, then captured several screens of the action as well as some posed shots of the Team Fortress family in art appreciation mode. He then framed and hung those screen caps in a real-world gallery of the pottery he'd displayed on the TF2 server. He said he chose Team Fortress 2 for the task not only because it allowed him to accomplish his goals with relative ease but because of the game's highly-expressive characters. "Without these characters, I feel my virtual gallery would have seemed stale and bland," he told PC Gamer. "The characters in TF2 are really expressive and I had a lot of people at my exhibition looking in amazement and laughing their asses off because the characters are believable." "Digital work is like no other medium. Because this work is virtual, I am able to share it with the rest of the world faster than any ancient Roman potter could have dreamed," he continued. "As a ceramic artist I have to look at the historical context of my work. Why should my art be relevant in a contemporary setting when people have been making pottery for thousands of years? By placing my pottery into a video game, I hoped to bridge this vast gap in time." Wyant is currently at work on creating a second virtual gallery and is seeking submissions for display from the TF2 community. Gamers with an artistic bent who'd like to take part can learn more about the technical and submission requirements at the Team Fortress 2 forum on Steam.